Greg progressed from the dizzy heights of being an auditor at Ernst & Young, through business planning at Hertz, into financial training – initially at BPP. He has also tutored courses in the CFA program for a number of years, along with ICAEW, ACCA and CIMA. 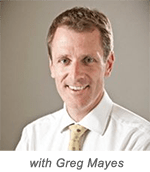 Greg has been Head of Professional Development at Barclays Global Investors – the largest asset manager in the world with over $1.8Tr assets under management – and a Financial Products Trainer for internal and external clients of Barclays Capital. He is currently a principal at Capital City Training.